Goodridge stainless steel braided brake lines have become the standard in professional motor sports where the ultimate in braking is required. This Technology is now available for most makes of Cars, Trucks and SUVs. There is no room for volumetric expansion, or Mushy Brakes caused by rubber lines. A highly efficient braking system allows you to get deeper into the corner and onto the accelerator faster. Additionally, when G-Stop brake hoses are used with an ABS braking system they virtually eliminate brake pedal Chatter and significantly reduce stopping distance. 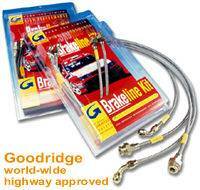 The advantages of Goodridge G-Stop Brake lines are not only for the high performance vehicles they are also a terrific performance enhancement and safety improvement on the daily driver. A reduction in braking distance during a panic stop can reduce the possibility of accidents and save lives. Each set of Goodridge G-Stop brake lines are constructed from the finest quality hose, consisting of a PTFE inner and a stainless steel overbraid and pressure tested to 3,000psi. G-Stop brake lines conform to all federal requirements of FMVSS106, making them D.O.T. Certified and T.U.V. Approved.